I, like many kids from the mean streets of suburban Cleveland, am no stranger to the joust. After watching dozens of my friends succumb to the tempress that is the boat joust, I too cut my teeth shovin’ chumps into the depths of the Cuyahoga. That, dear readers, is why it’s so painful to watch the people of Cannes, France fall prey to the same sport that has shattered the lives of thousands. 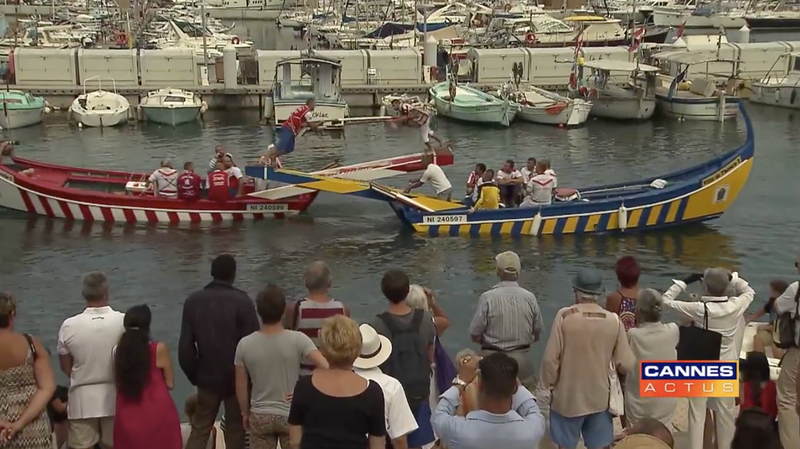 It may look jovial, but the boat joust hides its life-destroying fierceness under a friendly guise of entertainment. Lest ye be fooled, I’m here to warn you of the dangers. At first, it’s merely compulsion. You live for the joust. I’d say you eat, breath and sleep the joust, but truly you don’t sleep. You can’t. Every second is practicing, competing or agonizing over how to do better. Even when you lie in bed, you’re constantly startled away from slumber by a phantom pole that you feel on your chest, shoving you off the boat and into the abyss of an empty life. Oh hush, you may be saying, secure in the knowledge that you’ll never fall in. I’m too good to lose, goes the fool’s refrain. Well, that’s the dirty secret of the boat joust. The only way not to lose is never to play. Heed not the call of the sirens. It can only bring trouble. Oh, and the aforementioned venereal diseases.